"It all started as far as I was concerned in the Local Studies Library at Manchester in July 1989 when I came across a verbatim account of the Insolvency Hearing of Robert Churchman Hulley MD held at Lancaster Assizes in December 1851. He was described as formerly of 25 St John Street and late of 49 Great Jackson Street Manchester. I found him living at St John Street on the filmed census returns for the Deansgate sub-district but I was interested in finding out more about the Great Jackson Street address. The returns for the western side of Great Jackson Street were complete but those for the eastern side were missing and I was informed by the staff that they had been lost. This was a big disappointment and it wasn’t until 1991 that I helped to correct this situation. In March 1991 I joined an expectant group of several London-based Manchester and Lancashire Family History Society members at a meeting held at the Public Record Office Chancery Lane when John Coupe the Society’s editor of its 1851 surname index books and Susan Lumas of the PRO explained the background and proposed modus operandi of the transcription project." (To see Ray's final report on the project, please CLICK HERE. The work was commenced under Ray's leadership by a small team of volunteers working at Chancery Lane. 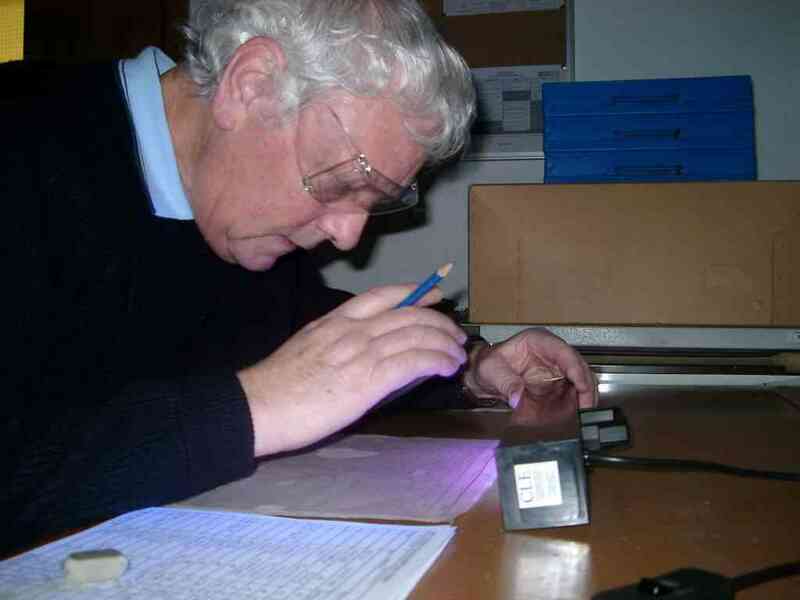 Volunteers were not initially allowed to use any form of artificial light and reliance on natural daylight was the only means of reading the badly damaged returns. Completed transcriptions were forwarded to a team of volunteers based in Manchester under the leadership of Frances de Courcy for entry into a database. The project was later transferred to Kew with the formation of The National Archives in 1997. At Kew, the team was under the general supervision of the Conservation Department whose Head Mario Aleppo went out of his way to assist. Mario introduced the team to the latest ultra-violet (UV) scanning equipment and we entered a brand new world of text recovery! Our recovery rates improved so much that we decided to re-examine those returns previously transcribed to increase the numbers recovered. A number of the most fragile pages had been laminated to protect them. The Conservation Department were kind enough to remove the lamination temporarily. This noticeably improved our recovery rate. Details on the returns were transcribed in so far as they were legible and in many cases this means that only parts of names or other details could be deciphered or there was uncertainty, particularly regarding names. In some cases contemporary street directories and rate books were used to confirm that names had been interpreted correctly. Temptation was, however, resisted to include information which it was felt "should" have been present if it could not actually be seen on the page. When the project produced its first completed transcripts, microfiche was the obvious choice for the publication of what would ultimately amount to tens of thousands of pages. It was the intention from the outset to publish reconstituted pages showing as precisely as possible what could be deciphered on each page. Name and street indexes were derived from the data to assist the users. Printed masters were produced from the databases initially by the late Alec Marlow and later by John Marsden and transferred to microfiche by a local company. As the 20th century drew to a close, publishing on CDROM became a practical alternative which allowed us to considerably reduce publication costs and make it easier to access the material (very soon more people had computers than owned microfiche readers). Data for newly completed sub-districts was immediately published on CDROM and previous material was reissued in this format. The launch of the Federation of Family History Societies' pay-to-view site FamilyHistoryOnline provided a new means of making this data more widely available and at lower cost to those whose use would be limited. Images of the reconstituted pages were published on the site and made accessible via a name index. The project continued for over 14 years and concluded in 2005 with the publication of the final sub-district returns (Chorlton-on-Medlock). From a starting point where this material was considered lost, a surprising amount of information has been recovered. The recovery rates are shown in the table below. Because the data had been analysed before the books were damaged, we know quite precisely the numbers of people who should have been found in each district. The overall recovery rate of 82% is the more impressive given that parts of some pages had completely disintegrated with the inevitable loss of all the details they contained.